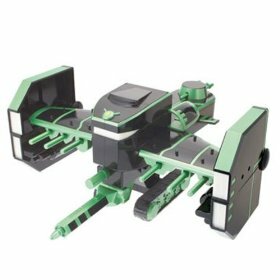 Ben 10 and his team have now aquired their very own glow-in-the-dark gunship. Decked out with toy missiles and rockets. Take apart to create three small attack vehicles to combine to form the awesome gunship. Includes exclusive Ben Ten ship figure that can also be used to disengage the spaceship. Upgrade gunship can also be used with most Alien Collection figures.